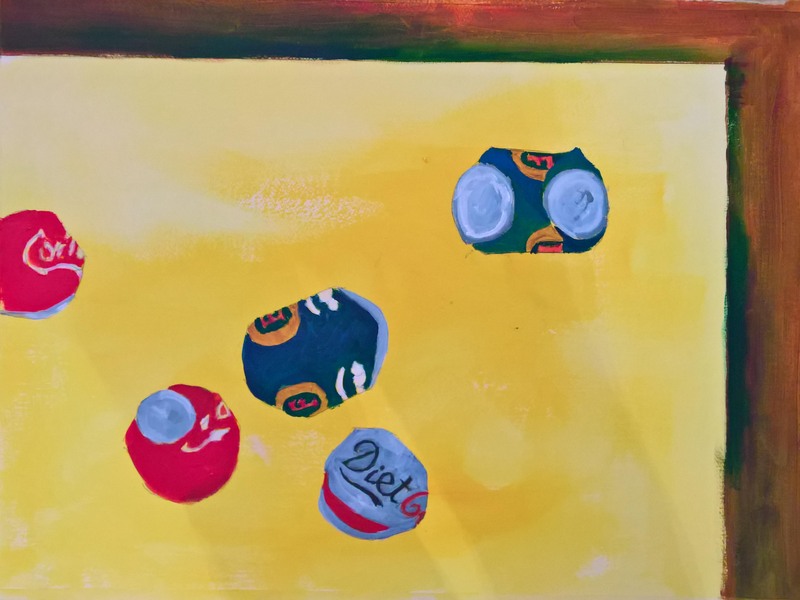 I flattened a few cans with the hammer, gently like, so that they would have interesting shapes and arranged them on the floor on a piece of paper on top of another sheet of paper jigged about with things till the arrangement pleased me and then I just painted away. What do I like? I like that each of my objects has a bit of red in them, this keeps the eye moving across the picture. I like that putting rubbish in paintings gives them an edgy Rauschenberg feel. I like that the lack of shadows makes the objects seem to float like tropical fish. I like that there is just enough detail in the cans to make them recognisable as cans, with more detail they would be too dominant for the yellow ground. What don’t I like? I don’t like that the top can has a resemblance to an owl and it’s eyes keep following me round the room.